I wish my photographs depicted it better, but this Secret Garden really did have that feeling of being tucked away behind the screen of pines and filled with an array of flowers with the perfect rope swing hanging from the “old tree”. 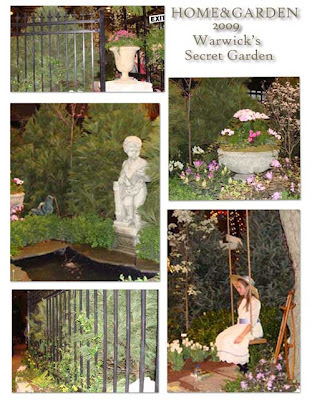 The Secret Garden was one of my favorite books as a child, and I read it over and over. The way it captured my imagination might have lead me along the primrose path of gardening to some degree. 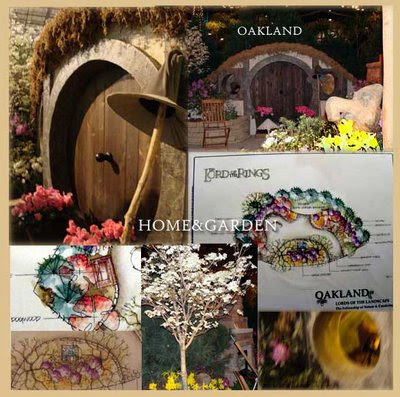 Warwicks did a very fine job on their display, and it was a good use of the type of garden design that would work well in our area, especially if you planned a spring season garden that is mainly green and shady in the summer. It illustrated how effective a statue can be in the right place. Too often such garden ornaments are plunked down in someone’s front yard, awkward and out of place. This one made sense secluded and featured near the classic water feature. I liked it. I’m experimenting putting pics together in a collage- haven’t quite struck on the style yet. Everyone wanted to see this one, and it was very crowded… we had to actually queue up to walk through it. The garden was packed with a little Zen garden with ripples carved in sand, pines, Japanese maples,a water feature and koi fish. Moon gates are very pleasing to the eye, and this one was no exception. I could imagine it being a very serene place of meditation if it was in a private garden. 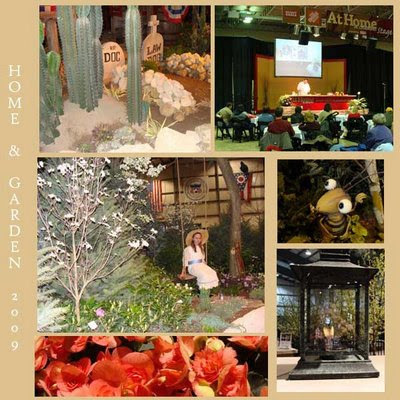 Here are two composite pictures from the Home and Garden Show. I went on Sunday afternoon, and it became very crowded. Cramped my photography, but I did take lots of photos- so I probably can make a couple more composites. 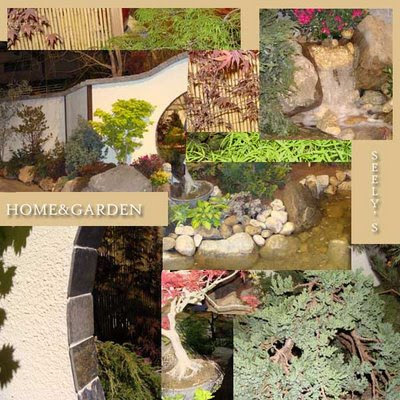 I think the strength of the show, for gardeners, was in the hardscaping: the paths, fountains, and walls. 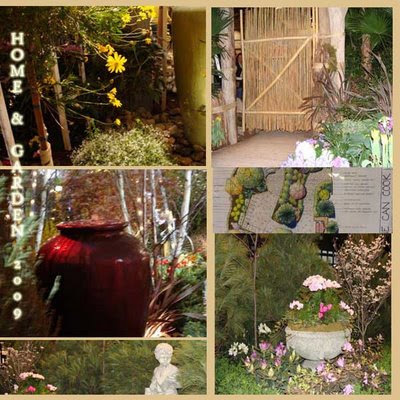 There are a lot of exhibitors in both the garden and home parts of the show which were in two separate buildings connected by a canopied hallway. My teens made it through without too much complaint- there were plenty of freebie candies on the Home side to keep them happy while I stayed mainly in the garden part taking photos and checking out the plant store exhibits. One large seed offering was available in the far corner of the exhibit hall. As I said, I think I will try to return this weekend. I do have a few criticisms of the show, as well as some things which I liked, but wanted to return to see if I just didn’t take advantage of what was offered in the lectures, etc. I hope you like the pictures, and I’ll give a few of the commentaries in a coming post.